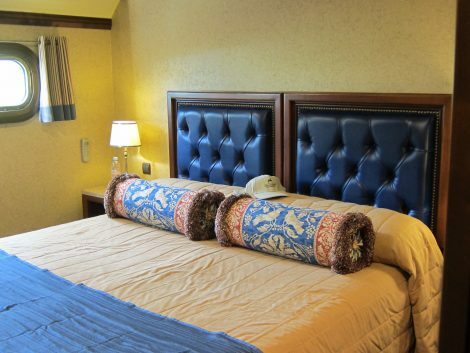 Shhh!…keep this between us as it’s not too cool for a travel writer to claim a favorite cruise. But when it comes to barging, I’ve taken two trips that I adored above all the others and just can’t stop praising them. 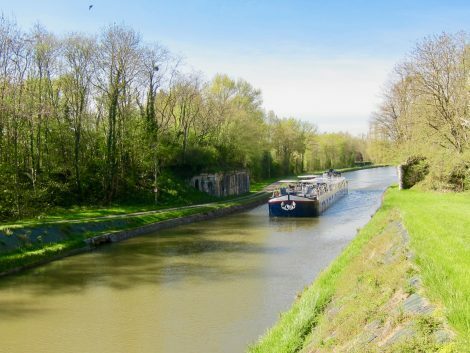 Both were on the same Horizon II, one of the luxurious hotel barges in the French Country Waterways fleet. 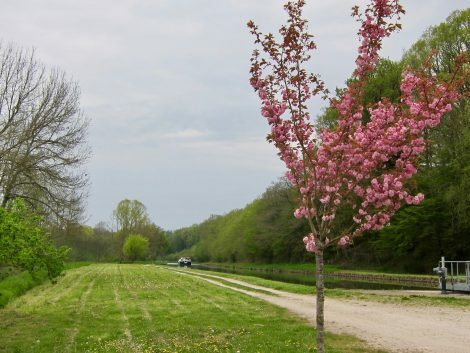 Both traveled divinely, dreamingly, deliciously through the ancient man-made canals of the Upper Loire in France. Same vessel. Same country. Same itinerary. Different years. Double-dipped delight. So what is it about the Horizon II that inspires devotion? A barge is a barge is a barge. 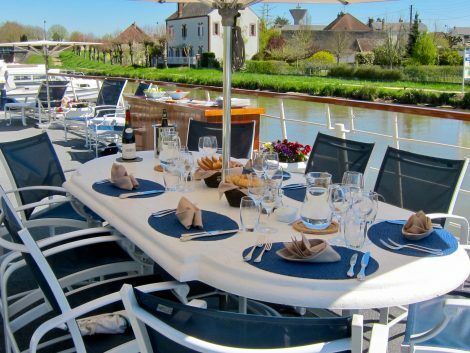 Most reconstructed hotel barges floating in France have the same dimensions. The number of passengers tucked into allotted space offers best clue to comfort. The supremely comfortable Horizon II carries only eight passengers, which maximizes bedroom size, public area space per person and personal attention. The large bedrooms sit on a lower level, down a few stairs. En suite bathrooms overflow with amenities including Bvlgari products, heated towel racks, fluffy bathrobes and great showers. 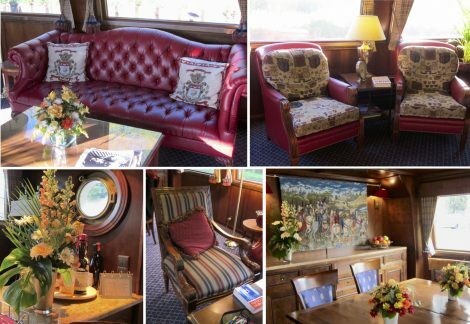 The dining room/lounge/library/help-yourself bar (which staff stocks with passengers’ favorite brands) occupies the mid-level deck and is the place where passengers gather for drinks, meals, relaxing and conversation. The upper level sundeck stretches over the front of the barge, a few steps up from the lounge. Passengers use the sundeck for alfresco dining, sunshine lounging and to embark and disembark from the barge at docks. 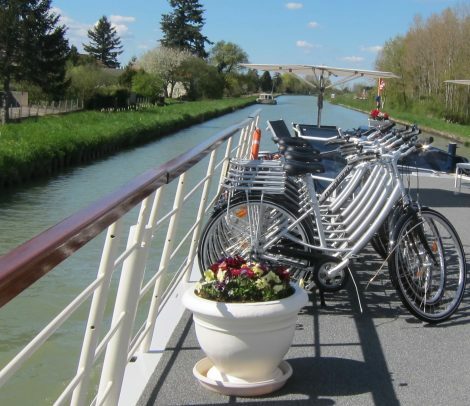 Passengers can borrow a bike stored on the sundeck and hop off of the barge as it travels through a lock, and then bike or stroll to the next lock to re-board. 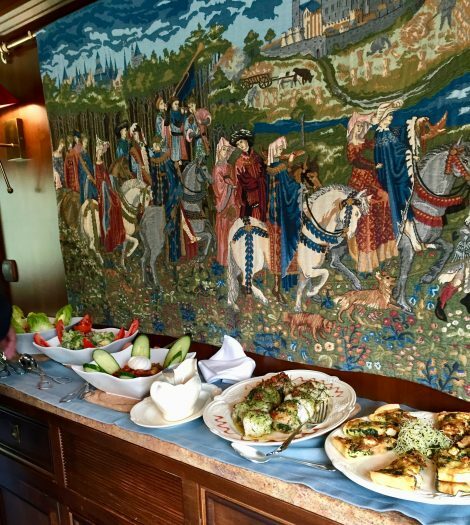 French cherry wood walls, red and blue solids, patterns and plaids for fabrics, and nautical finishing touches make the barge feel as cozy as a country house, and chic as an upscale boutique hotel. 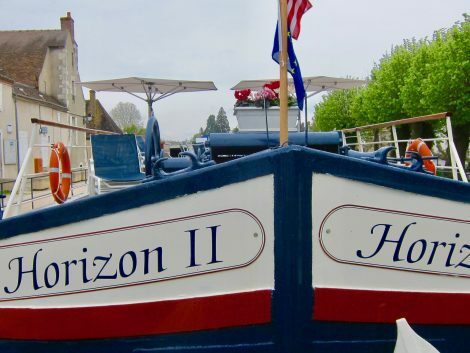 The Horizon II’s talented crew consists of a captain, a chef, two hostesses, a tour guide and a deckhand. (Six crew to eight passengers—a pampering ratio if there ever was one.) Although some of the crew on most of the cruises are French, all speak fluent English. Eating and drinking on the Horizon II could substitute as a crash course in French culinary delights. 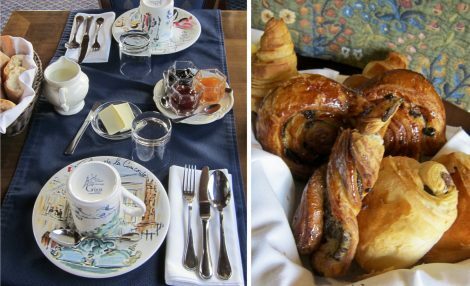 Breakfast comes with breads and pastries purchased in dawns early light from the best bakery wherever the barge docks. 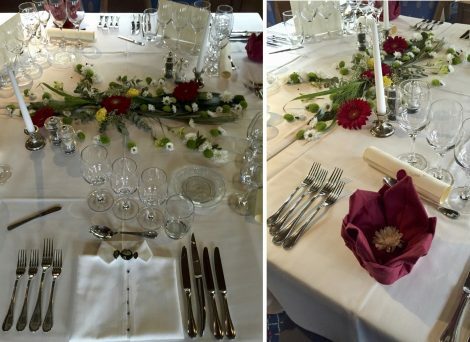 Multi-course dinners match any served at three-star restaurants. 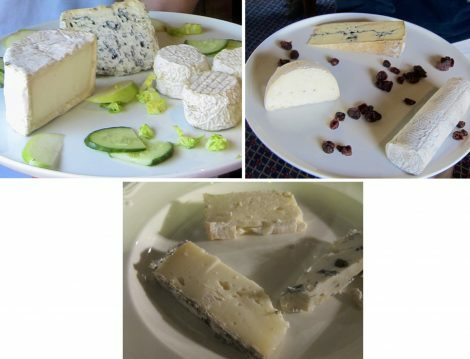 Three extraordinary French cheeses accompany each lunch and dinner as does a dramatic selection of Premier Cru, Grand Cru and special wines available only locally. Nothing much happens on the barge trip and that’s the beauty of it. The barge docks at night, on the outskirts of tiny villages. 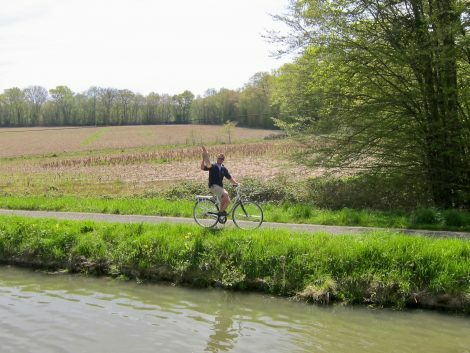 During the day, it glides with the grace and pace of a swan through ancient canals and locks, floating through backyards of villages and fertile countrysides. Once a day, passengers take a tour or excursion, by foot or car to some point of nearby interest. 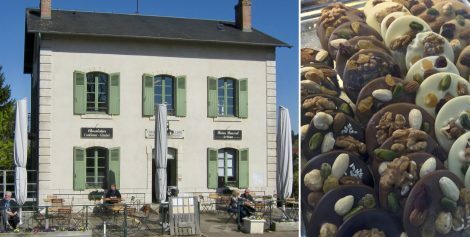 Excursions could, and usually do, include: visits to legendary châteaux, wine tastings, and tours of tiny villages, some with terrific shopping opportunities, e.g. 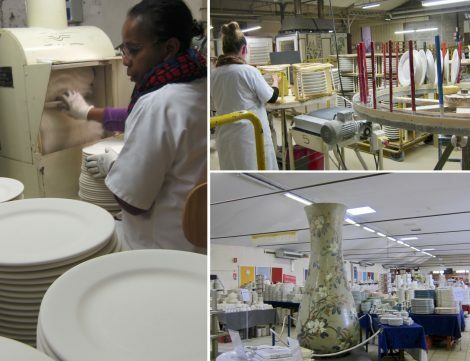 famous chocolate shops and the renowned Gien French Faience dinnerware factory and outlet. 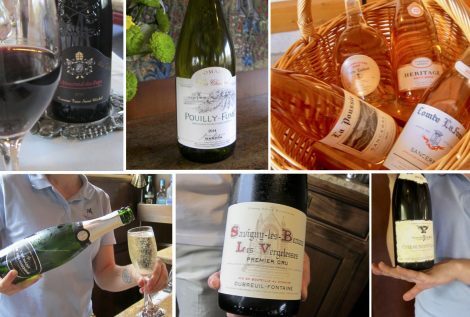 But excursions aside, the best part of a Horizon II trip is simply being on board, drinking fabulous wines, eating luscious meals, maneuvering through locks, and relaxing on deck while floating through scenery where every blink reveals a picture postcard image of rural perfection and every minute brings pure pampering pleasure. 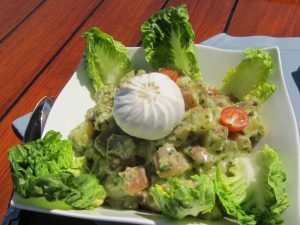 Halve cabbage. Cut away core. Sliver remaining cabbage and put slivers into a bowl. Add raisins, pine nuts and chives. Toss. Sprinkle to taste with hazelnut vinaigrette and toss gently to distribute ingredients. 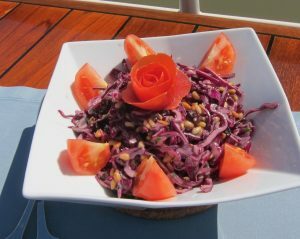 Cut tomato peel off of tomato and form into a “rose.” Place tomato rose in center of salad. Cut remaining tomato into wedges and place wedges around outer edge of salad. Put vinegar and mustard in a small bowl and whisk together until blended. Slowly whisk in the oils until dressing is emulsified. (Or place all ingredients in a screw-top jar and shake vigorously to blend thoroughly.) Season to taste with salt and pepper. Spread pine nuts on an ungreased baking sheet. Place in a preheated 350°F oven and roast, stirring often, until nuts are light golden brown, about 5 minutes. Watch carefully to prevent burning. Immediately remove from heat and transfer pine nuts to a plate to cool. Bring a large pot of water to a rapid boil and add 1 teaspoon salt. Cut unpeeled potatoes into bite size pieces and add to boiling water. Boil until potatoes are just tender when pierced with a small knife, about 10 minutes. Sprinkle potatoes with wine and toss very gently. Set potatoes aside to absorb wine. Make dressing: Whisk vinegar with mustard and 1/4-teaspoon salt until salt dissolves. Very slowly whisk in oil. Stir in parsley, gherkins and shallots. Pour dressing over warm potatoes and toss gently to blend. Serve warm or chilled, garnished as desired. For another great Horizon II recipe click HERE. 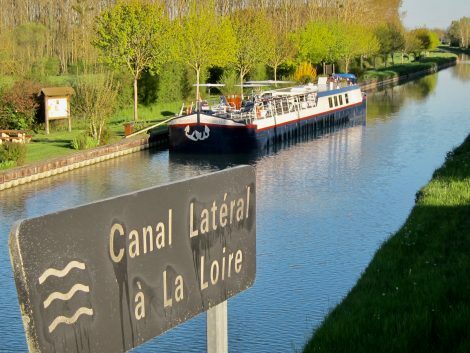 For French Country Waterways Information, click HERE.